When Will the World End - 2012? "And the seven judges of hell raised their torches, lighting the land with their livid flame. A stupor of despair went up to heaven when the god of the storm turned daylight into darkness, when he smashed the land like a cup"
The incredible Aztec Sun Stone is kept in the Museum of Mexico City. Is it possible to predict the future by studying the past? Our ancestors believed that destiny cannot be altered. Whatever is meant to happen, will happen. At present, many of us are focusing on the year of 2012. What is so special about that particular year? Will our current world be destroyed or will we perhaps experience a transformation of some kind? According to ancient records and beliefs, at least four marvelous worlds have already been destroyed due to global cataclysms in the past. During the last great cosmic catastrophe that occurred ten to twelve thousand years ago, the cosmic body that passed the Earth caused dramatic and severe climate changes. A poleshift led to the extinction of millions of life forms, humans, animals, and plants on Earth. The ancients studied the stars and the Sun because they believed the future could be predicted by examining the past. It was considered that time itself was linked to the cyclic movements of the Earth through the heavens. Many advanced ancient civilizations developed precessional calendars, which were 25,776 years in duration. A precessional cycle comprises of the 2,160-year ages of the Zodiac. The precessional calendars of our ancestors predicted the destruction of the old world and re-birth of a new world, as well as the return of the star gods. The ancients' myths of the previous worlds are striking similar. Our ancestors' calendars were also very advanced. This indicates that the ancient people shared the same memories and must have received their astronomical knowledge from the same source, the alien gods. Let us take a brief look at what some of our ancestors had to say about the past ages. The Native American tribes wisdom of the past world epochs is impressive. The Hopi Indians, an American culture consisting of about 5,000 inhabitants living in Arizona tell of worlds, which have all been destroyed by various cataclysms. Each of these worlds could be considered as a cycle of civilization. According to the Hopi we are currently living in the fourth world. The previous worlds were brought to an end by fire, a poleshift, and flooding. "The first world was destroyed, as a punishment for human misdemeanors, by an all-consuming fire that came from above and below. The second world ended when the terrestrial globe toppled from its axis and everything was covered with ice. The third world ended in a universal flood." The Aztecs were convinced that the world went through several ages called Suns. Each Sun lasted a specific time and at the end of the period, the world was destroyed in a cataclysmic event. The incredible Aztec Sun Stone is kept in the Museum of Mexico City. One of the most famous and precious Aztec artifacts is the great "Sun Stone". This fascinating object, which is a good proof of the ancients' astronomical knowledge, represents the four great suns of Aztec history. The Aztecs believed the world went through four creations and destruction's. 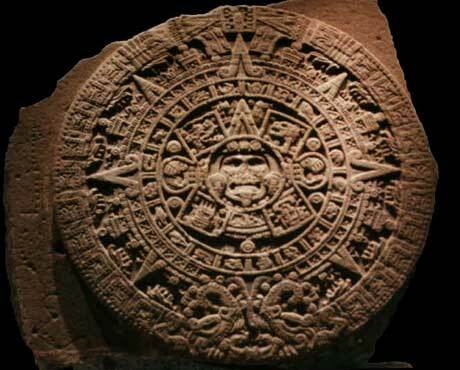 Each sun depicted on the Sun Stone is a period identified with a certain event that ended it. The Aztecs believed the first world belonged to the giants who died because of hunger. What caused the starvation? Was it perhaps a change of the climate, a drought? The second sun was ended by strong wind and the third sun was destroyed because of quakes, storms, and rain of fiery ashes. Finally, water ended the fourth sun, thus the Great Flood. We are now living in the fifth sun, which is characterized by great wars and diseases. It is said that earthquakes will end this world. Another clue to the cosmogony of the Aztecs is a valuable document called the "Codex Vaticanus". According to this paper, there were four ages of the world preceding the present one. Fourth Sun, Tzontlilic: duration 5,026 years. Men died of starvation after a deluge of blood and fire..."
The Aztecs called the fifth sun, "The Sun of Movement". This period in our history will end as a result of the Earth's movement. Unfortunately, the Aztecs did not provide us with any date of the ending of the current world. The Mayas, who were excellent astronomers, developed a calendar based on the cycle of the Pleiades. According to the Mayas, time operates in great cycles of creation and destruction. These cycles have duration of 5,125 years. The Mayas predict that the end of this world will begin at the end of the next great cosmic cycle, on December 21-23, 2012. There are of course some objections to these claims. For one thing, we cannot dismiss the possibility that although the Mayas were great astronomers, they could have miscalculated the date. A number of people, including some of the Mayan elders believe that the year 2012 is not a doomsday date, but represents rather a time of transformation. During this transition period, our world will experience environmental destructions, wars, and many Earth changes. The year 2012 should be considered as a date of re-birth, the start of the "World of the Fifth Sun". Interesting to note is, how could the Mayas have possibly known what the conditions would be like at this point in our history, as we head towards December, 2012? According to Hindu beliefs, everything has an end and a new beginning. Nothing is eternal, not even the gods themselves. Time is cyclical, and the creation is a continuous re-creation process. The Vedic scriptures divide the history of humankind into four epochs, or world "yugas" (ages). The first world epoch, the Krita yuga, which was most perfect of all ages lasted for 4,800 divine years. One divine year corresponds to as much as 360 human years. Thus, the Krita yuga lasted 1,728,000 human years. The gods' extremely long lifespan was often considered a sign of immortality. WITH THE LORD, A DAY IS LIKE A THOUSAND YEARS AND A THOUSAND YEARS ARE LIKE A DAY. The next wor$ld epoch, the Treta yuga lasted 3,600 divine years, meaning 1,296,000 human years. Then followed the Dvapara yuga. This era lasted 2,400 divine years, 864,000 human years. The Hindu people believe that we are currently living in the yuga of "Kali", the Goddess of Destruction. During the various epochs, all the worshipped yuga deities have a different color. Do the colors merely have a symbolic meaning, or has our planet, during every world epoch, been assigned to an extraterrestrial being, a god, whose primary task was to control and guard the Earth? This present age, the Kali yuga will be the shortest of all the four ages. It will last only 1,200 divine years, 432,000 human years. Characteristic for this world age are natural disasters and tyrannical rulers. "Nor is this world inhabited by man the first of things Earthly created by God. He made several worlds before ours, but he destroyed them all." Each of the previous worlds was destroyed in a cataclysm. The Jews believe that the world exists in cycles, each lasting seven thousand years. The ending of a cycle is considered a transformation. The ancient Greeks on the other hand had accounts of five different races, which inhabited Earth during various ages. One of the greatest problems with the calculation of the approaching end of the world is the fact that the starting points of world calendars differ. The Jewish calendar begins at the supposed date of the creation of the world, 3,761 B.C. The Greek calendar starts 776 B.C., when the first Olympiad began. The Roman calendar begins 753 B.C., this is the date of the foundation of Rome. The starting point of the Islamic calendar is 622 A.D., the year in which Mohammed left Mecca, and the Christian calendar begins with the birth of Jesus Christ. This means that those who believe that the world will end 2012 should consider what this year means in relation to the various world calendars. An ending brought to our world caused by a celestial body is also described in the Holy Bible. Revelation repeatedly refers to a cosmic catastrophe and Ezekiel tells that during the End of Days fire and brimstone will fall from the skies, and there will be great earthquakes, plagues, and wars. 6:12 And I saw when he opened the sixth seal, and there was a great earthquake; and the sun became black as sackcloth of hair, and the whole moon became as blood; 6:13 and the stars of the heaven fell unto the earth, as a fig tree casteth her unripe figs when she is shaken of a great wind. 6:14 And the heaven was removed as a scroll when it is rolled up; and every mountain and island were moved out of their places. The Bible does not provide us with a date when this disaster will occur. The only warning we have is that these events begin with the return of anti-Christ. Author of "Voices from Legendary Times: We are a bridge between past and future."